generates a plot in which the geographic regions regi are colored according to the values vali. generates a plot in which the geographic subdivisions of reg are colored according to the values EntityValue[…,val]. generates a plot in which the geographic regions in entityclass are colored according to the values EntityValue[…,val]. The reg1 can be Entity objects such as countries corresponding to extended geographic regions, or geometric constructs with GeoPosition coordinates. The geometric constructs supported by GeoRegionValuePlot include Rectangle, Polygon, Disk, and GeoDisk. By default, GeoRegionValuePlot outlines and shades the specified regions over a street map without labels. The vali can be either numbers or colors. 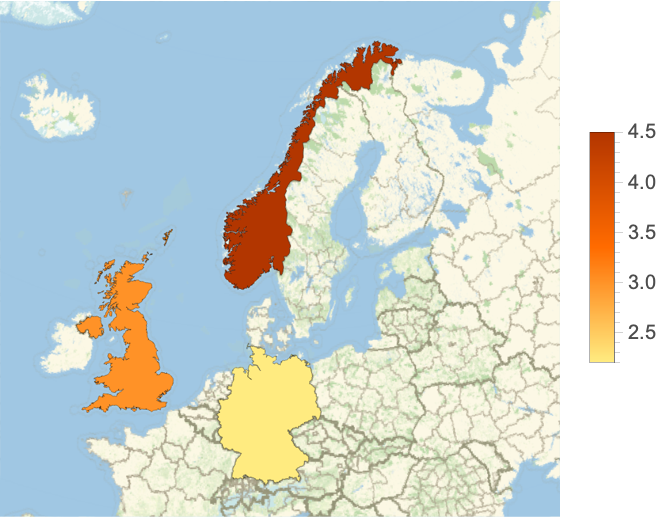 GeoRegionValuePlot evaluates to a GeoGraphics object. The arguments supplied to functions in GeoLabels are graphicsi, regi, EntityValue[regi,"Position"], and vali, where graphicsi is the Graphics or GeoGraphics object that marks regi, by default either a Point or a Polygon. PlotLegends->Histogram can be used to display the vali in a histogram in the legend.